The Algonquin Hotel: The historic hotel and bar where literary members of the "Round Table" gathered from 1919 to 1929. 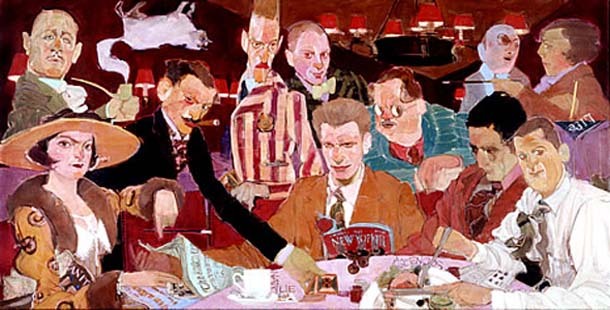 In the 1920s, “The Vicious Cirlce” consisting of columnists, playwrights, wits, actors, and critics including Dorothy Parker, Robert Benchley, and Harold Ross met daily at the Algonquin. Meeting for lunch, the literarians would munch on inexpensive popovers and celery at their own private table while engaging in a daily repartee that was documented in newspaper columns across the country. Even today, the hotel strives to continue it’s support of young writers. Up until it’s closure for renovations early this year, they offered lunch discounts to struggling writers and discounted room rates for writers on tour in exchange for autographed copies of their books. Let’s hope that when the Algonquin re-open’s its doors in May 2012 that they will continue their commitment to writers young and old, established and struggling. We also are excited to pay homage to the hotel cat, Matilda, and to order our favorite martinis (unfortunately no discount available there).  Archived in Best Places to Drink in New York City, Hottest Authors, Iconic Literary Ladies, Iconic Literary Men, Must Visit NYC. Bookmark the permalink.